Click photo to download. 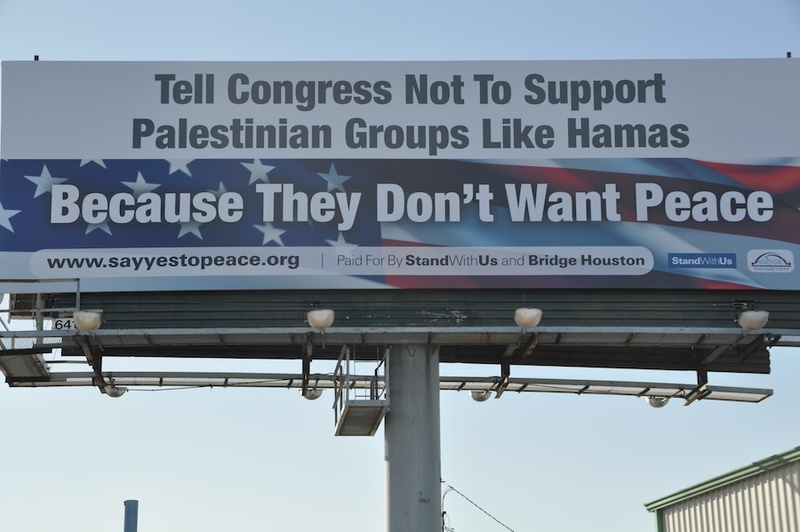 Caption: A billboard erected by StandWithUs and Bridge Houston to counter an anti-Israel billboard in the city that had called for an end to U.S. military aid to Israel. Credit: Bridge Houston. Israel’s adversaries have found a new weapon in their ongoing campaign to defame Israel: billboards. Since 2007, anti-Israel activists have posted billboards on highways, subways, and buses in major cities across the United States. These billboards call for the end of military aid to Israel, postulate that if the U.S. stops aiding Israel there will be peace, or fabricate maps to distort the region’s history. Viewers are referred to websites filled with revisionist history, misinformation and the now familiar name-calling in the continual demonization of the small Jewish state. The billboards purposefully omit context as to why Israel must defend herself: ongoing threats from Hamas-controlled Gaza, burgeoning threats from terrorist cells in the West Bank, and existential threats from nuclear-aspiring countries such as Iran. The boycott movement that promotes the anti-Israel messages ignores the terrible reality that when Israel has withdrawn from land in hopes of peace—such as from Gaza in 2005—Israel received thousands of rockets in response. StandWithUs (SWU) was deeply concerned about these billboards. Misinformation repeated often enough can seem to be truth. Passive passersby on their daily commute can begin to subliminally absorb the billboard’s anti-Israel message. The passerby who takes the time to read them and follow-up by visiting the recommended website would be exposed to more propaganda. More disturbing, viewers could begin to regard the billboards’ extremist messages as normal and even mainstream. SWU recognized that it was essential to correct the misinformation, and even more, saw the billboard battles as an opportunity to educate the public about Israel. SWU committed to countering this campaign by posting its own billboards in response—a billboard for a billboard. SWU does not initiate the billboards, but has countered anti-Israel posters since 2007. The organization designs billboards with messages that address the specific issue presented. They are posted immediately after the anti-Israel ads finish their run. As the anti-Israel campaign has evolved, so have SWU’s billboards. Five times in 2011-12, SWU countered anti-Israel billboards displayed in San Francisco and Berkeley BART stations and Muni buses. Billboards in Denver in April 2012 promoted the story of “Baby Israela, delivered by Israeli Medics in Haiti,” and highlighted the message that “Israel Saves Lives.” In July 2012, it was six ads in 75 locations in New York’s Metro-North stations with maps establishing the 3,000-year continual Jewish presence in the region, to counter BDS (boycott, divestment and sanctions) maps that misrepresented the region’s history. In 2013, ads have already appeared in Sacramento and Portland. The most utilized SWU billboard features a Palestinian and Israeli boy hugging, asking the Palestinian Authority to recognize Israel as its neighbor and as a Jewish state. The message emphasizes Israel’s desire for peace. Other billboards remind viewers of the many times the Palestinians have said no to peace offers and others inform viewers of Israel's achievements in water technology, AIDS research and how Israel’s investments in the United States have generated domestic jobs. Groups that publicize misinformation about Israel and misrepresent the issues should understand that pro-Israel groups such as SWU will be there to inform the public and bring balance. SWU is committed to bringing truth to the table—or to the billboards. Roz Rothstein (left) is CEO of StandWithUs. Roberta Seid, PhD (right) is research-education director of StandWithUs. Posted on February 24, 2013 by JNS.org and filed under Israel, Opinion, U.S..